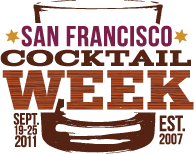 We’ve partnered with the world’s best spirits companies as well as an array of community partners and venues to celebrate the Bay Area and West Coast’s liquid culture, cocktail heritage and bar talent. For seven straight days we’ll host series of extraordinary special events. Explore the list below for enticing details and tickets. More details and events will be added on a regular basis, so check back often! Early bird pricing is available through August 31, so buy your tickets now for the best deal.